Bad news for BSV today: the price of Bitcoin Satoshi Vision, the crypto born from the fork of Bitcoin Cash, loses an additional 20%. 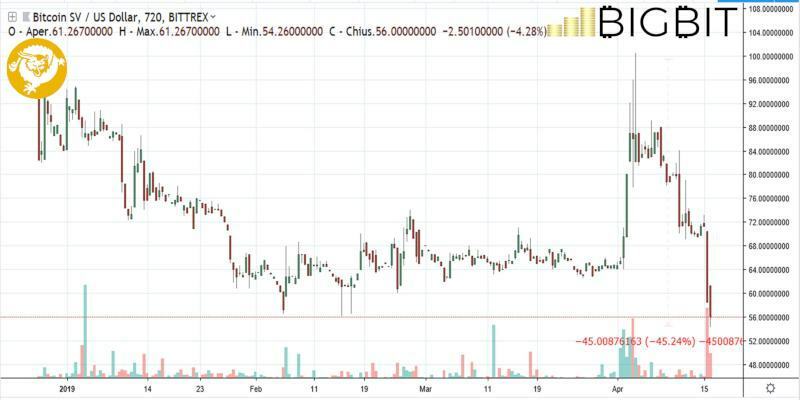 A loss that added to those of the last days sees a drop of more than 30% from the levels of last Tuesday and more than 45% from the peak of early April. Bitcoin SV suffers from the delisting decisions of Binance as well as other exchanges, including Shapeshift and the decision to be taken off the Blockchain.com wallet. Yesterday Kraken launched a survey to ask its users whether or not they are interested in keeping Bitcoin SV listed. In just a few hours, more than 70% voted with their thumbs down, calling BSV a toxic token. On the contrary, other exchanges maintain this crypto. For example, OKEx, an exchange based in Malta, has announced that it will currently maintain the BSV trading pairs. This uncertainty will decree in the next weeks the life or death of this crypto, which was born from the Bitcoin Cash fork last mid-November. Not only BSV: the major cryptocurrencies, except Bitcoin Cash, are all under par. Looking at the first 100 listed on Coinmarketcap, more than 85% are in negative territory. These markdowns bring most of the top 20 back to testing last weekend’s support levels. Only Bitcoin Cash in the last 24 hours continues to maintain a bullish setting. 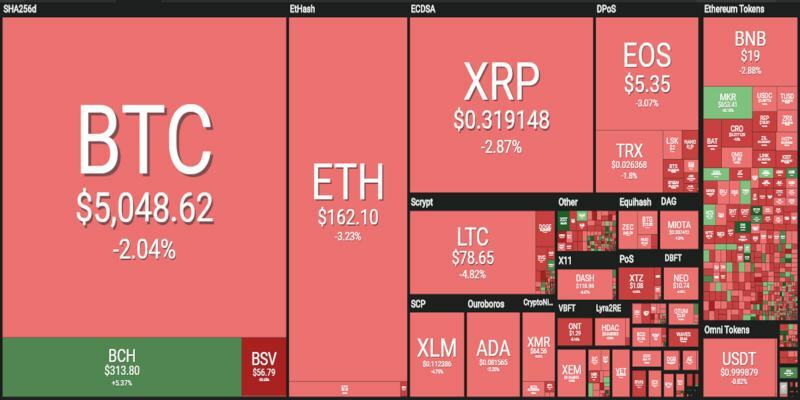 It is the only one among the top 30 that manages to stay above parity with a good rise that is close to 5% and that brings the prices of BCH close to the highs of early April at 330 dollars. It should be noted that the sum of the two quotations BCH and BSV today is between 380 and 390 dollars, 15% lower than the quotations of Bitcoin Cash before the November fork. Total capitalisation falls and approaches $172 billion. 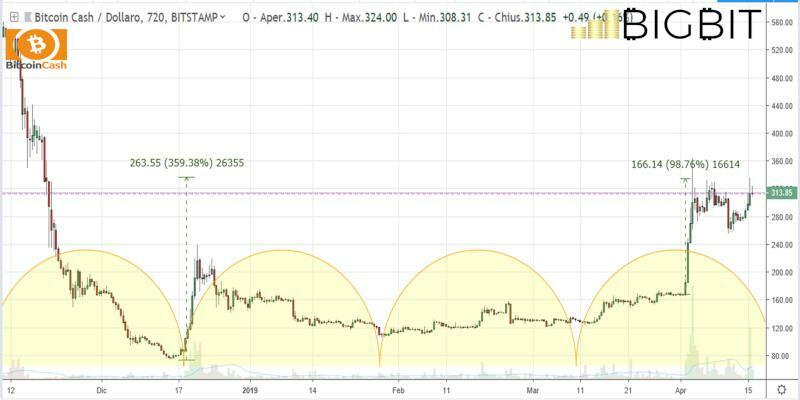 In the generalised weakness, the dominance of bitcoin returns to rise, attracting once again investors who take refuge in the queen of cryptocurrencies in times of uncertainty and tension. Today, in fact, bitcoin sees its market share rise to more than 52%. Volumes remain stable, with trades exceeding 43 billion dollars. Bitcoin returns to the levels of Thursday and Friday, close to the psychological threshold of 5,000 dollars. The strong overbuying of the last few days is slowly beginning to unload. It will be important to observe where prices will form a support before the next upward turn in line with the beginning of the monthly sub-cycle. It remains important to keep the 4,800 dollars, in case of a slide below this quota it is necessary that the prices do not return close to the 4,500 dollars in a monthly context. Attracting purchases at the $5,400 level will again be an important bullish signal. The structure of the monthly cycle, which began with the lows at the end of March, continues to remain unstable. The breaking of the resistance of the 165 dollars that between late March and early April has become a triple maximum threshold is a return below critical levels. 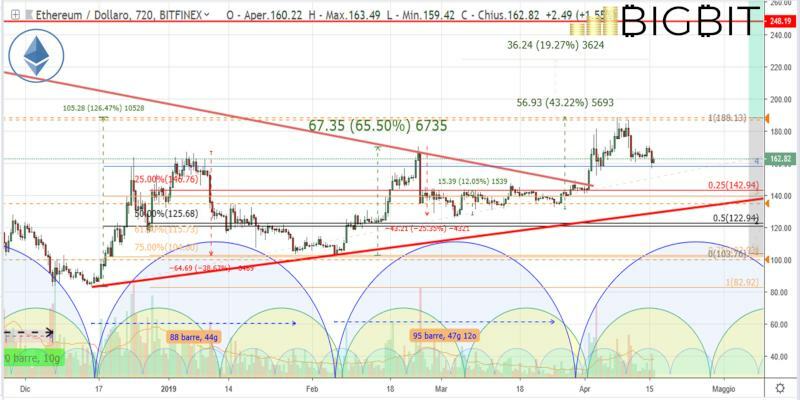 The $165 is the level where Ethereum prices have been fluctuating since last Thursday evening and is definitely a signal that operators are testing but do not know if it will hold up in the next few hours and days. 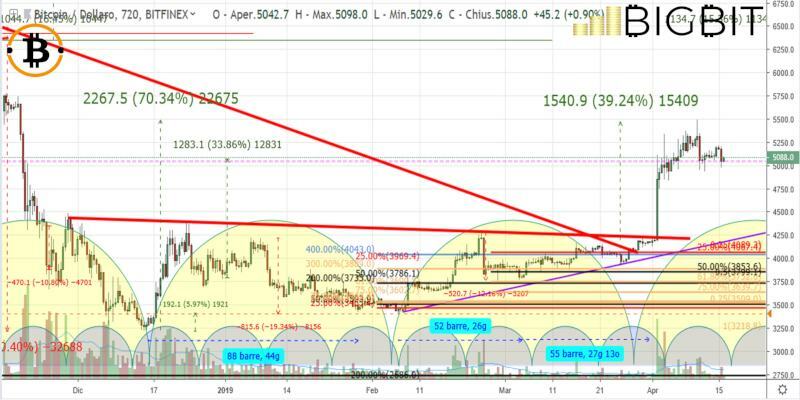 It is important not to come back with prices below 155 dollars, in case of breakage it is necessary to keep the static and dynamic support of 135-140 dollars. A signal of strength as was evident last weekend will be renewed with the return of prices over 180 dollars quota. For ETH, it is necessary to resume this threshold and confirm the bullish intensity of previous monthly cycles. Previous articleWill Bitfinex delist Bitcoin SV?